Discussion in 'Tone Zone' started by syscokid, Dec 31, 2015. In our garage, we have an old dresser that's full of "stuff". In it, I found this NOS Leo Quan bridge, "Made In Germany" with the USA Pat#. I don't remember when or where I acquired this, but it is in new and unused condition. Saddles are not notched. What's the story on these? 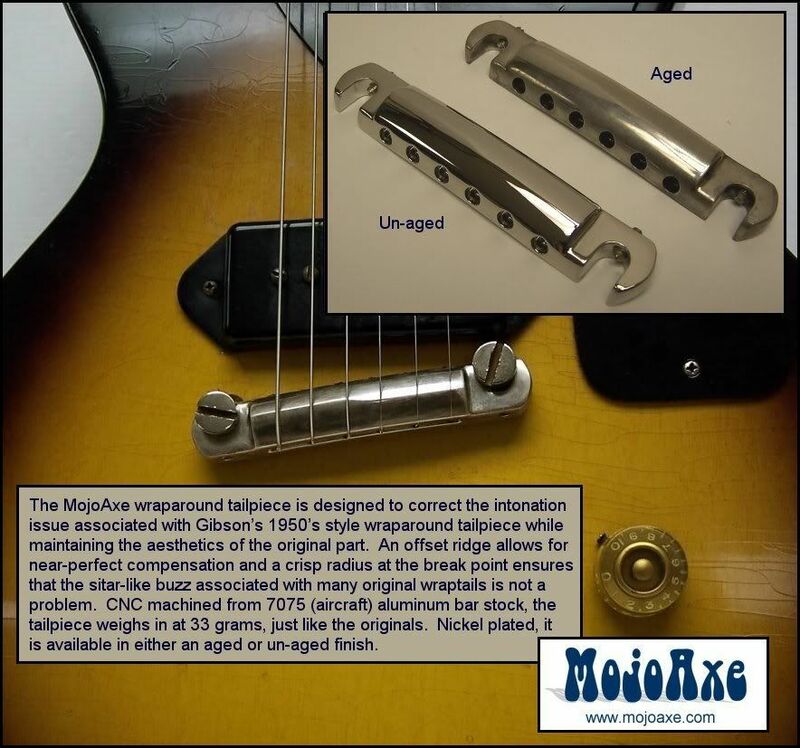 Excellent quality replacement for the old stop bar tailpieces on Les Paul and SG Juniors. They are no longer made, although there are other option. If you want to sell it, ask me first please. I'd like a spare, especially in that condition. I have cheap copies on both my Epi LP Special 1 and my '61 SG Reissue and they bring the guitars in perfect intonation territory. It actually has longer intonation on the copy, and the adjusting screws for the poles are a little more discreet. I chewed up the post slots on one of my guitars like that using a screwdriver. Then my tech suggested using a coin instead, as they are softer and won't damage the slots like hardened screwdriver. He was right! and the adjusting screws for the poles are a little more discreet. So this is about as primitive as you can get! This one below is a non raised lightening bar type! But Gibson was making some wrap-arounds in 2007 for the Melody Maker line that improved upon the stop bar wrap-around without using the raised step lightening bar approach. ala ... BAAM! That's about as clean & primitive as you can get without going straight stop-bar or raised lightening bolt! And I got one that came on one of those 2007 Melody Makers I got five years back or so. Maybe that is the answer to my Melody Maker dilemma right there! If not, we might have found a low-profile one for that Melody Maker below.?? So what do you think? Wanna swap that Quann for that compensated low-pro non raised stop bar?! That be it! Earlier in the day, I ordered a new TonePros VTNA wapa-wound. I just couldn't get past the busier look of LQ for my current project. That bridge you posted is a Shroeder. I bought one, and received it a couple of weeks ago. F'n beautiful, quality all over, but I have come to the conclusion that I will not like the way it looks if I try to install it on the Jr kit because of the offset stud holes. The Shroeder is very symmetrical, and looks weird when it's cocked like that in that pic. If I would have planned a little better, I would have asked the manufacturer (PGK), to drill the stud holes to a modern, intonatable bridge pattern instead of the offset vintage '61 SG Jr style. You want primitive ? There's only one way to get good intonation and look the part. syscokid and SG John like this. OK, No frik'n pic posted! Waazzup wit dat shizzle me nizzle? That be it! Earlier in the day, I ordered a new TonePros VTNA Wap wapa-wound. I just couldn't get past the busier look of LQ for my current project. Cha bro that pointed tail thang is messin with me too after a while lookin at it. I just put that low-pro non lightning bolt Melody Maker Compensated bridge we wre just talking about (see pic below) on the 67 Melody Maker & it too ended up being an optical illusion as the bridge height is still pretty high! Those two are PRS wrap around but I've been having a hard time finding a pic of the Gibson wrap around that is very similar but smaller & rounder & more resembling this one below. I went to snap an actual pic but me shizzle was deadizzle on the fizzle my nizzle. On the 'Bright' side & I mean bright, that bridge change did bring things to life with a noticeable added singing quality to the guitar strings acoustically. I'm going to have to break down & start a thread that picks peoples minds for lowering these strings with the right low-profile bridge. There has got to be a good bridge that just doesn't sit the strings as high up!! I'm going nuts looking for one & I'm sure SOMEBODY out there on our forum just knows right off the top of their head as this is a common problem with these M.M.'s. Wow, is this what happens when Mel Gibson isn't around to throw decent action roles at Danny Glover anymore? The Shroeder bridge really is a beautiful piece of hardware. I might try it on my PT SG. That one has the Lightning Bolt bridge. Stoopid internet was playing tircks on me last night. It is the MojoAxe I was talking about.